“An amazing night with friends new and old,” shared North Central Executive Director, Megan Koester. 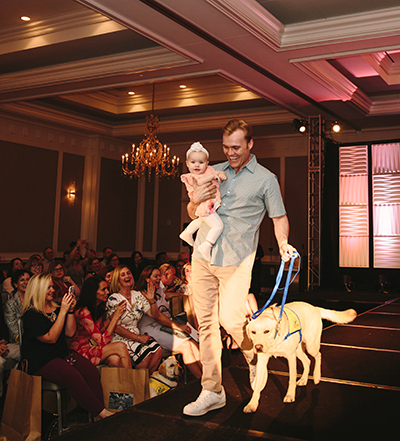 The second annual HAUTE DOG I COLUMBUS was a night full of independence as three central Ohio teams shared their stories of how Canine Companions impacted their life and community with a room full of Columbus leaders and influencers. Each team had a lasting story that guests walked away with. One of those stories was from Canine Companions team Brien and Facility Dog Fido. Brien shared with everyone the vast scope of impact that a Canine Companions facility dog has on the community through his work at Goodwill Columbus. "Fido wears many 'hats'. Overtime I’ve seen Fido’s impact in three different ways; physically, emotionally, and socially. Physically - Fido gets people moving. Simple activities such as petting Fido allows proper range of motion, finger dexterity, and controlled movements for those with Cerebral Palsy and secondary conditions such as arthritis. Many folks love tossing beach balls and hitting balloons to Fido to have him bump them back to him when playing games such as Beach Ball Volleyball and Balloon Noodle Badminton, which Fido also really enjoys. Emotionally - Fido brings a smile to each person’s face that he meets. Fido cheers people up. There are times our participants have bad days, just like all of us have from time to time. Fido can help calm or distract them from their worries by simply entering the room. Fido will sit with folks that need someone to talk with or just be there for. Fido is also that dog that many of our participants never had a chance to have. Many of our participants never had a dog because of their living arrangements. Some living in group homes never had a pet as an option. So Fido acts as their dog that they can get that unconditional love from. Socially - Fido gets people communicating. Our participants have learned many of Fido’s commands. Saying those commands with confidence and firmness can cross over to their own lives when advocating for themselves on what they would like to do in their life. Fido also brings people together. Fido is a conversation opener. If in the community or interacting with volunteers and students at our site, Fido is a line for communication. People want to interact with him, which when done together, opens the avenue for conversation between people that might never acknowledged each other. Fido has made a world of difference." 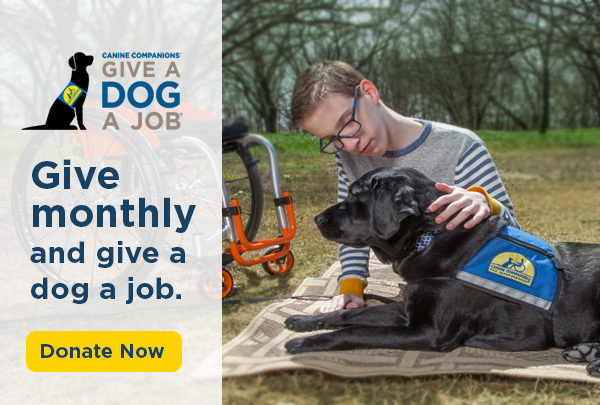 Brien wasn't the only team to share the impact that his four-legged partner has, Canine Companions graduate Mike shared how Naomi was there to help with the transition from college to living on his own. "After graduating from undergrad and moving out of my fraternity house I thought I might need more assistance as I began living on my own. I wanted to remain as independent as possible and after doing research I realized that a Canine Companions assistance dogs was a great solution. I quickly realized what a great organization Canine Companions is and how good of a fit it would be for me." Graduate Josh Sommers concluded the program with a story that had everyone laughing and crying as he shared how Debra impacted his life after being injured serving his country in Afghanistan. "I have seen Debra do more things without opposable thumbs than I have seen most people do. She can turn light switches on with just her paws and her nose. Giving her a command and seeing her do it is amazing. No matter what I ask her to do she just looks at me, wags her tail and gives me a kiss. I love having her by my side. She is my best friend!" With a great 2018 in the books, Canine Companions is gearing up for 2019. If you missed out on the fun this year, be sure to join us in 2019. Click here to keep up to date on next year’s excitement!